The perfect venue for a casual family holiday, or a budget stopover as you explore the spectacular NSW Mid North Coast. Sail, paddleboard, surf, kayak, swim, fish or just laze on the sun-lounge and listen to the birds in this tranquil waterfront setting. Bongo's can accommodate up to 5 people and is a fully self-contained two bedroom villa set on 1.4 hectares of park-like grounds. The open plan living area with well equipped kitchen leads out to the sunny terrace. The locals like to gather on the lakes edge for a drink to watch the sky change colours at sun set. Cook some meat from the local butcher on the barbecue, put together a salad and dinner is ready. DVDs, CDs, books and games are all provided for relaxing on the comfy lounge, whatever the weather. The master bedroom has a queen bed and the second bedroom has three single beds, including a bunk bed. Reverse cycle air-conditioning makes the villa a cool retreat in summer and cosy in winter. A laundry is available on-site. Linen and towels are not provided. Kids love playing in the warm, shallow water of the lake right in front of Bongo's. Walk or paddle across the lake to Sandbar ocean beach or fish from the shore. Explore the lake and its islands by kayak, catamaran or dinghy, all available for hire from the famous Frothy Coffee Boatshed, just a 10 minute walk. If you have your own boat, it can be launched from the small boat ramp on our beach and left there for the duration of your stay (at your own risk of course). Use the on-site tennis court or kick a ball on the extensive lawns in front of Bongo's. .
SMITHS LAKE is the smallest of the Great Lakes and is popular for kayaks, paddleboards, fishing and sailing. SMITHS LAKE is a beautiful little village set amongst rainforest. A walk to the top of the hill finds a small shopping centre with café, takeaway, supermarket, bakery and bottle shop. If the kids aren't already exhausted from swimming all day there is a children's playground on the lake's edge and a skate park near the Bowling Club to keep them busy. The Pacific Palms Bowling Club is open for lunch and dinner every day. 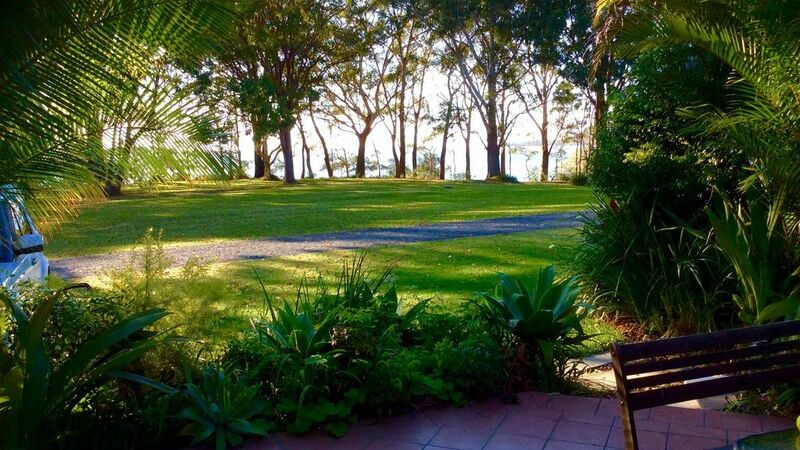 SANDBAR is just a few minutes drive and offers 4wd beach access (permit required), beach fishing and a 9 hole golf course, complete with resident kangaroos. CELLITOS BEACH is found at the end of a breathtaking boardwalk through sub-tropical rainforest. Enjoy the pristine surf beach or explore the extensive rock pools. ELIZABETH, SHELLY, BOOMERANG and BLUEYS BEACH are all only a 5 minute drive. Elizabeth Beach is a patrolled beach great for families, while Boomerang and Bluey's are known for their surf. Shelly Beach is tucked away in the National Park and is clothing optional. There are lots of restaurants and cafes in this area. WALLIS LAKE is another option for boating enthusiasts or for just watching the sunset over the lake with a glass of your favourite tipple. SEAL ROCKS is an iconic surfing village that is only a 20 minute drive from Bongo's. Walk up to Sugarloaf Point Lighthouse to enjoy the magnificent view and find out a little of the area's history. NATIONAL PARKS surround Smiths Lake. Visit Myall Lakes, Wallingat and Booti Booti National Parks to enjoy picnics, bushwalking, cycling and scenic drives. FORSTER is only a 20 minute drive and provides access to major supermarkets cinema, ten pin bowling, dolphin cruises and many more attractions. A reverse cycle air conditioning unit will keep you cool in summer and warm in winter. Coin operated washing machine is available on site in the shared laundry and you are welcome to use the clothes line. Coin operated dryer is available in the shared laundry on site. Parking for two cars right in front of the villa, and space for the boat trailer down near the water. Casual dining is our thing and we have lots of unbreakable ware for the kids. Hi Andrew, Thanks for your review. Can you elaborate more as to the issue with the beds. This is something that hasn't been raised before and we are always looking to make improvements. Fabulous lakeside location. Perfect for kids. The BBQ on the deck is a big plus, as is the addition of air conditioning for extra hot days. Thanks for a great stay. very comfortable and relaxing stay at bongo's. great position for our children to play outdoors. Had a great weekend at Bongo's Beach Bungalow in January. Weather was perfect and bungalow was fantastic! Thanks for letting us stay! Hi Linda, yes Bongo's is in a special location on the waterfront and looking out to Sandbar Beach and the Ocean, a magical spot. Thanks for the feed back, it's all on the things to do list, glad you enjoyed yourselves.